Yet another gift guide, just in time for the holidays! This time it's for Francophiles. I love, love the design and photo editing of this. Also, the quote, "Where ever you go, go with all your heart" is quite fitting. It doesn't hurt that Confucius said the quote. Madewell is the sister company to J. Crew, which isn't at all French-based but actually US based. They have a lot of stuff that reminds me of the effortless chic of the French so that's why they're included on this list. This scarf has placards of neighborhoods in Paris. I love the simplicity of this necklace and the quirkiness of it. Plus, it has the words, "Je taime" which makes it so much better! Paris Review actually has nothing to do with Paris at all but I thought I'd stick it into here. It's one of my favorite literary magazines and they produce a lot of quality stuff. The classic children's story that's a tad depressing due to the dark colors but still quite interesting. It chronicles the adventures of Madeline, a girl who lives in a boarding school that's " an old house in Paris,... covered with vines." where the girls are in "two straight lines". Thank you! :D Madeline was one of my favorite children's books. Also, it's also one of the reasons why I love Paris. 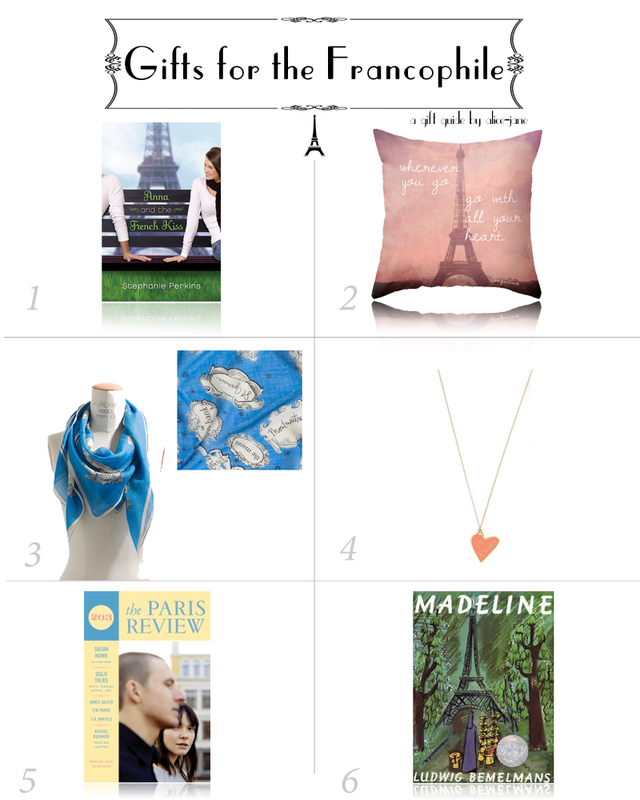 I did a gift guide today too! (http://mysistersbookshelf.com if you need any ideas for guys!) I am a total francophile so I was excited to see yours! I like the Je t'aime necklace - I might get that for my sister!